Five weeks ago our winter batch of meat birds arrived, a replacement batch for the ill-fated group that ended up being a nice meal for a mama opossum and her babies instead of us. Fortunately this batch has been uneventful, just growing big and doing what meat birds do—eat, drink and poop…lots of poop. We usually raise two batches each year, but now that Brianne is off at college I’m figuring out how to live, cook and farm as a single person. If I raise them up to about 6 pounds I can cut them in half, which will give me 30 meals. But, if I quarter them or cut them into parts I can make those 15 birds go even farther. Raising fall birds is a nice option in our area. The weather is warm enough that the chicks only need a heat lamp at night, and since we don’t have the searing heat of summer the chicks grow easily without any stress from the heat. We do have to pay closer attention to the weather though. A sudden cold snap makes it necessary to keep chicks warm all day long until they are feathered out. With the festivities and cooking of Thanksgiving over I concentrated on some needed farm chores. Gates were moved and fixed. The barn was cleaned. 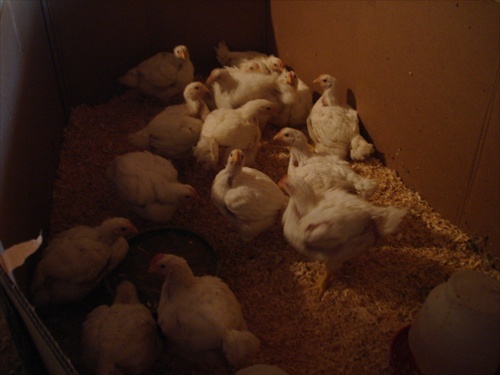 And, the chicks were moved out of the garage and into the barn where they will stay until butchering time. Fence panels that will contain the birds were put up, straw laid down, automatic waterers installed, feeders set up and finally, two at a time, the chicks were moved. The 8-foot by 8-foot pen will allow the chicks more room to move around, but will also protect them from the elements. The hens and goose were not quite sure about their new roomies, but by later afternoon everyone had gotten use to each other and the meat birds had settled in nicely. By the time Christmas rolls around I’ll have a freezer full of chicken. The late afternoon was spent cooking down the turkey carcass to make batches of meat and broth, the beginnings of soup, casseroles or pot pies. The remains of the breast meat was cut away and saved for sandwiches and salads, while two large stock pots bubbled on the stove full of bones, herbs, veggies and broth. When the pots had simmered for more than 30-minutes the carcass parts were placed on a cutting board to cool before the meat was stripped away. Once cleaned, the carcass had yielded more than six cups of meat. Stored in 3-cup freezer containers the turkey and broth will be the perfect amount for small-batch cooking. It always amazes me how much meat can be cleaned for those simmered down bones.